Cycling deaths in London – Boris to make an exception of himself? 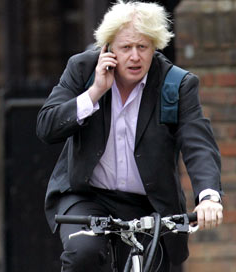 As part of his continuing efforts to blame cyclists for the recent spate of deaths on London’s roads, London Mayor Boris Johnson today said he was considering banning the use of headphones and smartphones while riding a bicycle. Presumably Boris’s ban will include an exception for bungling Old-Etonian mayors with ambitions to become prime minister then? So what’s the real reason Boris Johnson broke his promise not to cut London’s fire services? All he needs is a blue rinse and you won’t be able to tell him from one of the few women in his party.